Following a humble start as a consumption-focused RSS reader on iTunes, my6sense has grown to become a versatile intersection of news and social, consumption and sharing. The app, available for both iOS and Android, pulls in streams from Facebook, Twitter and Google Buzz, and lets you share out to each of these networks. Today, the company, where I am VP of Marketing, issued the latest update for the fast-growing Android platform - bringing native posting to the aforementioned networks within the app, and a helpful widget that brings your top news to you on your Android device. As you can imagine, creating an application that impacts social streams like Facebook, Twitter and Google Buzz presents its own challenges, as users start to expect the most advanced capabilities of native clients, such as TweetDeck and Seesmic. No sooner did we support these networks than did calls come for native replies, retweets, direct messages, likes and comments for each network. After knocking those off, the similar refrain continued as people wanted to update their status on the go directly from our app, instead of reading an update in our app and opening a second one to jump into the streams themselves. 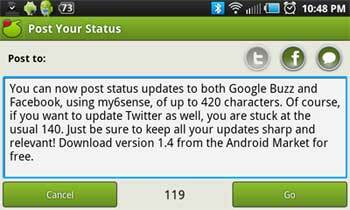 You can now Post to Your Networks in my6sense for Android. Version 1.4 of the application, available free on the Android Market, has a "Post" button in the top right of all streams. And it's not limited to just one stream at a time, either. 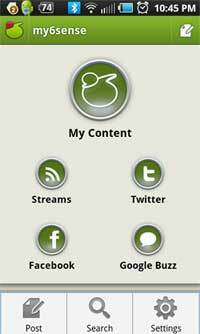 If you have connected your Facebook, Twitter and Buzz, you can post to any or each of the networks, much like the Seesmic-owned Ping.fm does. Of course, if you post to Twitter, the standard 140 character limit applies, and Facebook updates are similarly limited to 420 characters. That said, if you have a keyboard on your phone and you want to bang out War and Peace, point it at Google Buzz, and you can go as long as you like. One of the benefits of building out a sharp app for the Android platform is customization of a widget for the app - unavailable on iOS. Familiar with widgets from other platforms, which tend to show the most recent update, chronologically, we wanted to leverage the strength of our service, bringing personalized top news to you - and more than one update. The widget, a stylish black, scrolls through your top messages and you can click the up or down arrows to find them yourself, without opening the app. Find the article you like and click through to read. my6sense's core focus is, and will be, on making sure the best content gets to you as an individual, and that you don't miss important updates. We're working on making this digital intuition available in more places, and with more partners. But we want to make this a versatile Swiss Army knife that lets you jump into the streams with both feet. Brad of TheNextWeb, a great user and clear fan of the service, wrote about the updates, saying "my6sense for Android gets updates to take over as your social client of choice". Choice is a good thing. I will choose the smart apps that make me the most efficient. He also posted a great demo video you might like. If you are on Android and haven't already picked up the app, find it at http://bit.ly/m6sandroid. Disclosure: I am VP of Marketing at my6sense.